FormSmarts now allows customers1 to change the text part of the confirmation email we send to form users once their payment has been confirmed, as highlighted below. 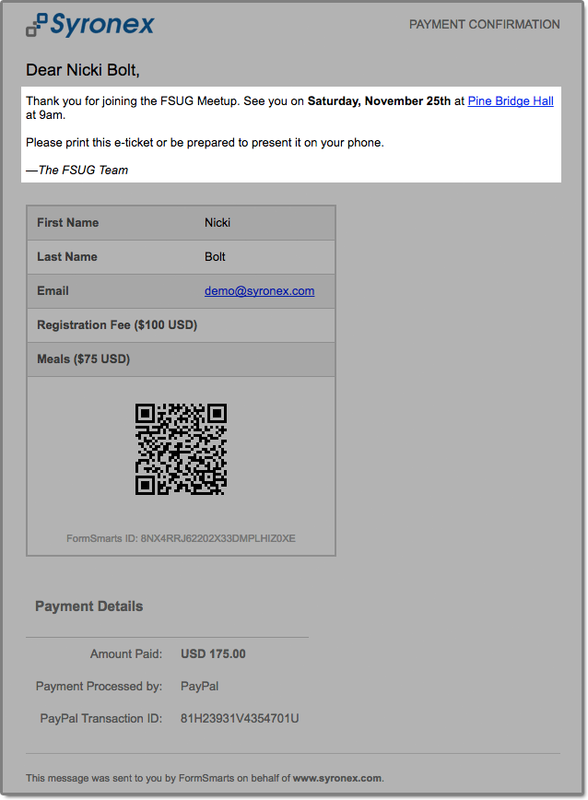 If you use FormSmarts for online event registration forms, edit the confirmation message to remind attendees of the date and time of the event, provide information about the venue location, and ask them to print a copy of the message or have it ready for inspection on their phone on the date of the event. To edit the confirmation message, log in to the form builder and click/tap the pen icon corresponding to the form you would like to edit, then visit the Submit Actions tab. You can emphasize a section of the text with bold or italics and you may include links and bullet points. The text can be formatted using the buttons provided or with the same Wiki-like syntax you can use elsewhere on your forms. Use the Preview button to visualize the formatted output of the message. As always, we value your feedback about this feature. Note: If you have verified your site and uploaded the logo of your organization to FormSmarts, it will appear at the top of the message. 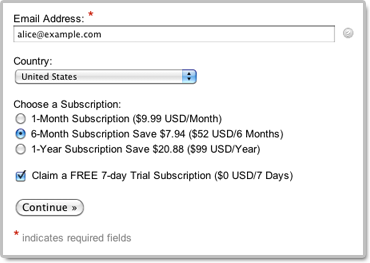 1 The confirmation email can only be customized with a Business Plus account or above. Posted on Sep 22nd, 2017 in payment form. 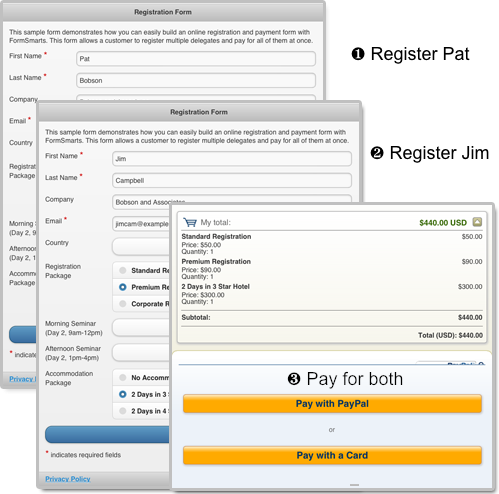 If you’re using our popular payment form feature to collect online payments on your membership and registration forms, chances are that some of your customers will want to pay by check, cash on site or by any other offline payment methods. 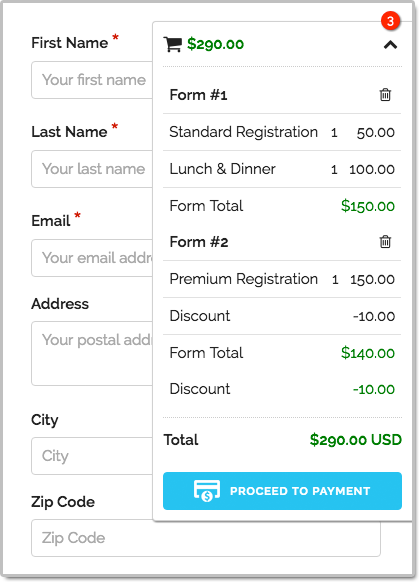 FormSmarts helps you manage check and cash payments by showing the total amount due on the printable Summary Page of a form and on the confirmation email and PDF receipt that users can get on that page. As illustrated above, the printout, PDF receipt and confirmation message all include a QR code to help you process payments more reliably and effectively. 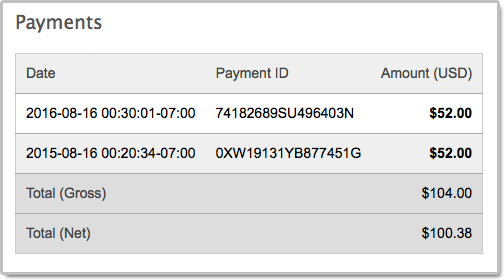 The Summary Page can also help you manage cash payments by allowing guests to show their confirmation email or PDF receipt (a.k.a. e-ticket) on their phone (or their printed receipt), that staff can scan to update the registration on FormSmarts. Since the amount due also appears in form response notification emails and PDFs, check-in staff can also reconcile e-tickets with the list of notification emails or registration PDFs even if there is no network connectivity. Rename the form and set On Submission to “Show summary with print, email & PDF options” in the Submit Actions tab of the Form Details screen. 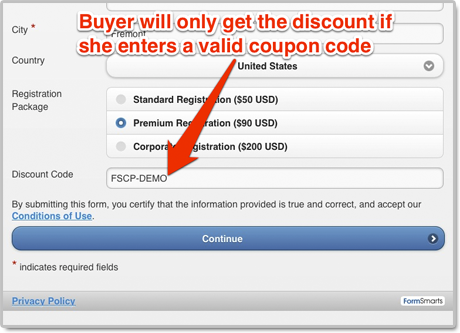 The Summary Page supports the same payment-related features as payment forms (except those for recurring payments), including discounts and discount codes. Can I Accept Online & Offline Payments on the Same Form? One of the benefits of FormSmarts payment integration is that we won’t notify you until the person has paid so you don’t have to check this yourself each time. If you have a form allowing both online and offline payments, you won’t know which customers have paid online, so you’ll have to review each and every form response. 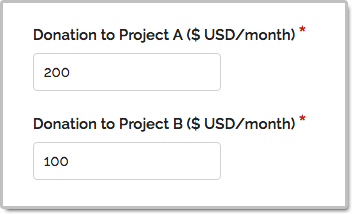 For this reason, we recommend that you create a copy of the form specifically for check payments and use the Summary Page setup described in the previous section, especially if there are several charges and fees on the form. You’ll then only have to track payments for entries pertaining to that form. You can make a copy of a form in a click with the Duplicate Form button in the upper right-hand corner of the form builder. If the user doesn’t select the online payment option, FormSmarts will skip the payment step and send you the form entry immediately. Note that people paying by check won’t receive any confirmation email. Posted on Aug 21st, 2017 in payment form. We started the new year with a number of updates to FormSmarts’ Advanced PayPal Integration. FormSmarts now allows you to accept both payments for a fixed amount (e.g. 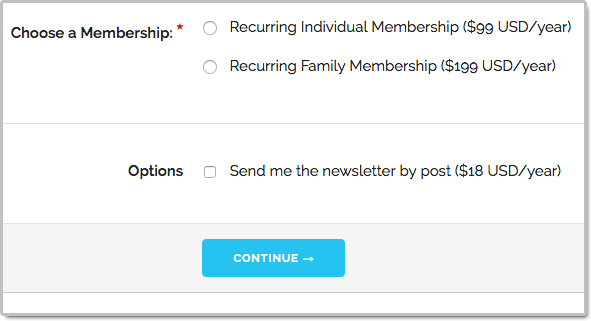 membership renewal, registration fee) and donations (which amount is chosen by the contributor) on the same form. This feature is typically aimed at non-profits that would like to collect contributions on their membership form or when taking online registrations for an event. Feel free to try this demo. A discount code can now cover the whole amount of the transaction. 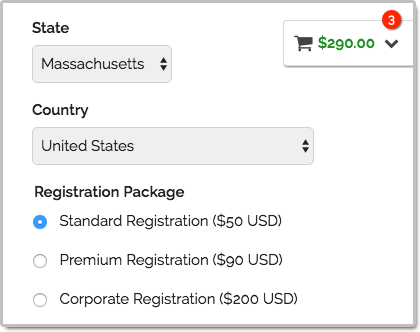 This would come useful on an event registration form: some attendees to whom you have given an offer code will be able to register for free, while the bulk of delegates will have to pay. In line with this change, we’ve also updated SuperCart to allow free registrations (or any other type of transactions) as part of a SuperCart session. 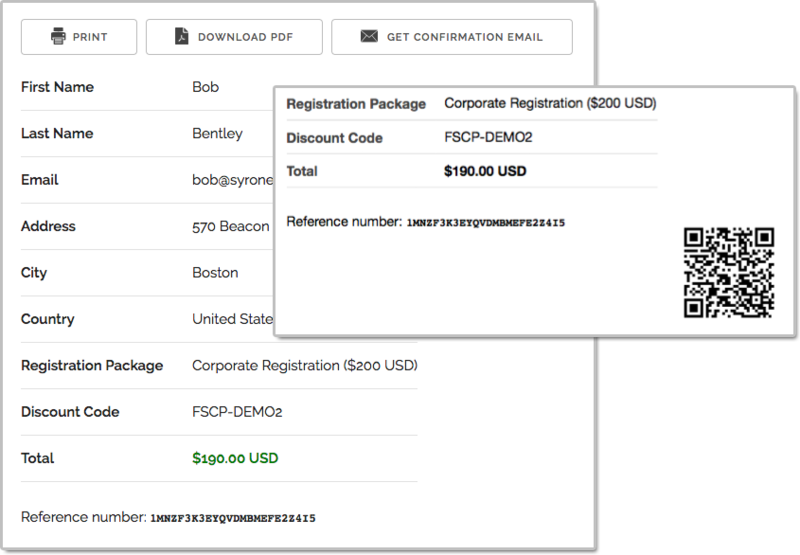 So non-paying delegates can be registered at the same time as paying delegates, within a single SuperCart session. Posted on Feb 18th, 2014 in payment form.